Unionist Voice can today reveal the intricate web of alleged conflicts that exist behind the nationalist ‘legacy activism’ movement. Unionist Voice would like to make clear that we believe this group of ‘legacy activists’ are to be viewed in an entirely different context than victims and their families, whose only desire is for truth and justice. Sadly, however, a growing coalition of politically motivated activists are working together in order to promote the re-writing of the past, and to pressurise the judiciary into promoting republicanism’s now discredited collusion narrative. Disgracefully they are using victims to promote this agenda. The company behind the discredited ‘No Stone Unturned’ documentary, based on a stolen Ombudsman report, is inextricably linked, via private commercial business interests, to the families solicitor Niall Murphy. Niall Murphy is a grassroots Sinn Fein activist, evidenced by the photo we publish today showing him canvassing for their North Belfast candidate. The journalist that received the stolen Police Ombudsman report works for a sister company of the film makers, Fine Point films. The above are facts, not allegations. They cannot be disputed. They raise serious questions about the propriety of the families solicitor being inextricably linked, via a directorship and shareholdings, to the company making a supposedly impartial documentary in relation to the awful events at Loughinisland. It is not clear whether Mr Murphy has received any financial benefit from the film, and for that reason we do not make that allegation. 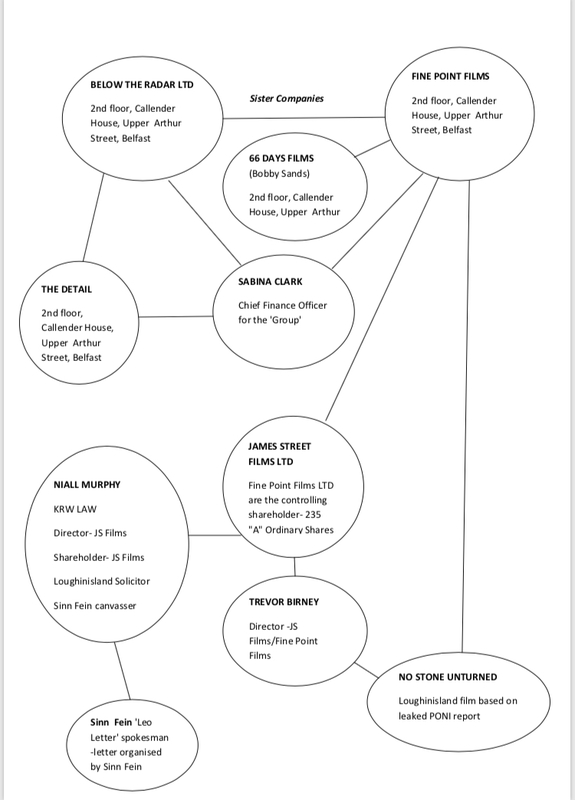 It is also clear that ‘The Detail’ is a sister company of the film makers, Fine Point films, therefore there is a clear link between the investigative journalists, the film makers and the families solicitor that all conspired to produce ‘No Stone Unturned’. The documentary is based on a discredited Ombudsman report which unlawfully made an allegation of ‘collusion’. There are further serious questions that will emerge in the coming days in relation to the Police Ombudsman’s involvement in this highly controversial enterprise. 139 Responses to "EXCLUSIVE: Legacy solicitors have questions to answer as links to business and Sinn Fein are exposed"
I do like the way you have framed this matter plus it does offer us a lot of fodder for consideration. Nonetheless, because of what precisely I have experienced, I basically hope when other commentary pile on that people today keep on issue and in no way start on a tirade involving some other news of the day. Anyway, thank you for this superb piece and although I can not really concur with the idea in totality, I respect the standpoint. going to book mark your site and keep checking for new details about once a week. want to…HaHa). You certainly put a brand new spin on a topic that has been written about for ages. internet the simplest factor to have in mind of. get a lot of spam remarks? If so how do you stop it, any plugin or anything you can recommend? lot more neatly-appreciated than you may be now. with Lady gaga! Your personal stuffs nice. Hello to every body, it’s my first pay a quick visit of this blog; this blog carries remarkable and actually fine material for readers. Your website provided us with useful info to work on. You’ve done a formidable job and our entire neighborhood will probably be grateful to you. Hello, Neat post. There is a problem with your web site in web explorer, could test this… IE nonetheless is the market chief and a large component of other folks will miss your magnificent writing because of this problem. Simply wish to say your article is as astonishing. The clearness in your post is simply nice and i can assume you are an expert on this subject. Well with your permission allow me to grab your RSS feed to keep up to date with forthcoming post. Thanks a million and please continue the enjoyable work. Hi, Neat post. There’s a problem with your website in internet explorer, would test this… IE still is the market leader and a huge portion of people will miss your magnificent writing due to this problem. You made some respectable factors there. I appeared on the internet for the difficulty and found most individuals will go together with with your website. I wanted to create you the very little word to thank you very much as before for these unique knowledge you have discussed at this time. It’s really incredibly generous with people like you to provide unhampered what many people would’ve marketed for an e book in making some dough on their own, especially seeing that you could have tried it if you ever wanted. These guidelines likewise acted to be the fantastic way to recognize that other people have a similar zeal similar to mine to find out significantly more with respect to this condition. I’m sure there are some more pleasurable periods in the future for individuals who examine your site. What’s Happening i’m new to this, I stumbled upon this I have found It positively helpful and it has helped me out loads. I hope to give a contribution & assist different users like its aided me. Great job. An outstanding share! I’ve just forwarded this onto a co-worker who had been conducting a little research on this. And he in fact ordered me breakfast due to the fact that I found it for him… lol. So let me reword this…. Thanks for the meal!! But yeah, thanx for spending time to talk about this issue here on your website. Wonderful website. Lots of useful info here. I’m sending it to several friends ans also sharing in delicious. And certainly, thank you on your effort! I’m impressed, I have to admit. Seldom do I encounter a blog that’s equally educative and engaging, and without a doubt, you’ve hit the nail on the head. The issue is something that not enough men and women are speaking intelligently about. I am very happy that I stumbled across this in my search for something regarding this. Hello! Someone in my Myspace group shared this website with us so I came to take a look. I’m definitely loving the information. I’m book-marking and will be tweeting this to my followers! Wonderful blog and great style and design. Hello Dear, are you truly visiting this web page regularly, if so afterward you will definitely obtain fastidious knowledge. Legacy solicitors have questions to answer as links to business and Sinn Fein are exposed | Unionist Voice is a little vanilla.